My son Cory was at college during most of the Days of Unleavened Bread, so he didn't get to have the unleavened pancakes that everyone seems to like so much. I was trying to decide what to fix for dinner and was thinking waffles. Cory said he'd like the unleavened pancakes, but I only had enough cottage cheese to make one batch, not enough for everyone. So I thought I'd make a batch of regular, ordinary pancakes too - but I saw this recipe when I pulled the cookbook out, so I made it instead. 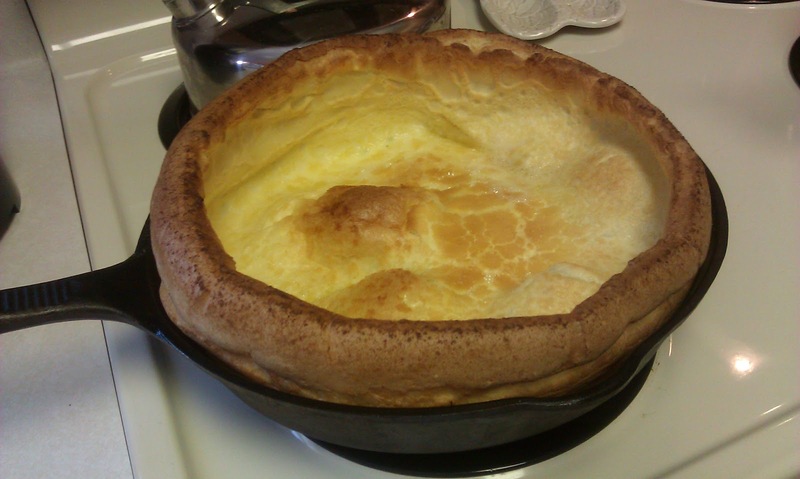 Pour into the hot skillet and bake about 25 minutes or till puffed and well browned. We had it with 'fried apples' - Melt 2 T butter in skillet over medium heat; add sliced apples (4 or 5); top with brown sugar (sorry, I didn't measure, just used 3 scoops from the canister), and cook until tender, stirring occasionally.